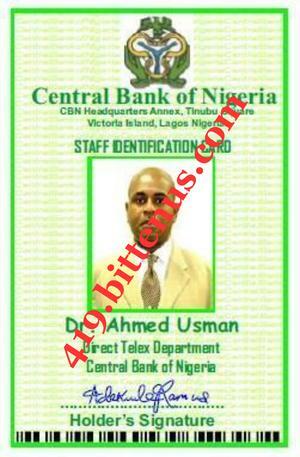 DIRECTOR TELEX/WIRE TRANSFER DEPT, CENTRAL BANK OF NIGERIA. WITH DUE RESPECT, WITH THE AUTHORITY CONFERRED ON US BY INTERMEDIARY DEPOSITOR TO THE CENTRAL BANK OF NIGERIA (UNITED BANK FOR AFRICA) WE GREATLY ACKNOWLEDGE RECEIPT OF YOUR PAYMENT INFORMATION FORWARDED TO THIS DEPARTMENT FROM THE PRUDENT CHAMBERS ABUJA ON WEDNESDAY 21ST JANUARY 2014, ON BEHALF OF THE MANAGEMENT OF CENTRAL BANK OF NEGERIA, I HEREBY OFFICIALLY WISH TO INFORM YOU THAT WE HAVE UNDER THE AUSPICES DIRECTIVES OF THE FINANCIAL DIRECTOR CENTRAL BANK OF NIGERIA, STARTED PROCEESIING FOR APPROVAL OF ALL LEGITIMATE DOCUMENTS IN YOUR FAVOR. HAVING CONFIRMED YOUR OWNERSHIP OF THE INHERITANCE FUNDS (US$20,000,000.00) PRINCIPAL AND ACCRUED INTEREST OF (US$2,000,000.00) ONLY. HOWEVER, WE HEREBY CONFIRM THAT YOUR NAME HAS BEEN KEYED IN THE CENTRAL COMPUTER DATABASE PAYMENT SYSTEM FOR THE RELEASE AND PAYMENT OF YOUR INHRERITANCE FUND BENEFIT (US$22,000,000.00) ONLY AS SOON AS ALL LEGITIMATE RELEVANT DOCUMENTS ARE APPROVED BY THE AUDITORS OF THE CENTRAL BANK OF NIGERIA (CBN) AND TRANSMITTED TO YOU. NOW IN COMPLIANCE WITH THE AUSPICES DIRECTIVE BY THE FINANCIAL DIRECTOR CENTRAL BANK OF NIGERIA, WE THEREFORE, DEMAND FOR YOUR DECISSION ON MODE OF TRANSFER OF YOUR FUNDS EITHER BY ELECTRONIC TRANSFER TO YOUR NORMINATED BANK ACCOUNT, VIA CBN UNIVERSAL DIPLOMATIC MEANS OR MILLOINAIRE PREMIUM ATM VISA CARD (PLEASE SPECIFY) BY CORRECTLY FILLING AS SPECIFIED IN THE TRANSFER APPLICATION FORM ATTACHED HEREIN TO ENABLE US START IMMEDIATE PROCESS OF THE AFOREMENTIONED FUNDS TO YOUR DESIGNATED ACCOUNT DETAILS.IN THIS REGARDS YOU ARE REQUIRED TO RE-CONFIRM YOUR DETAILS INFORMATION ACCORDINGLY BY FILLIING ACCURATELY THIS ATTACHED TRANSFER APPLICATION (FORM SWL/TF-01) ACCTACHED IN JPEG FORMAT FOR YOUR CONVENIENCE. YOU ARE ALSO REQUIRED TO FURNISH US WITH YOUR BANK’S MUNICIPAL ADDRESS BECAUSE THE CENTRAL BANK OF NIGERIA WILL NOT BE LIABLE FOR ANY WRONG TRANSFER OF YOUR FUNDS OR LIABILITY OF FUNDS CREDITED TO A GHOST ACCOUNT, HENCE IT IS IMPERATIVE TO CORRECTLY FILL THE FORM AND RETURN TO US ON OR BEFORE TWO BANK WORK DAYS FROM NOW. NOTE THAT THE MAXIMUM TIME ALLOWABLE FOR THE RETURN OF THIS TRANSFER APPLICATION FORM IS 2 BANK WORK DAYS OWING TO LIMITATION OF TIME, FAILURE TO COMPLY WITH THIS ORDER WILL RESULT TO YOUR PAYMENT BEING DELAYED, ONCE AGAIN IT WILL INTEREST YOU TO KNOW THAT YOUR NAME HAS PROGRAMMED IN THE CENTRAL COMPUTER DATABASE PAYMENT SYSTEM OF THE CENTRAL BANK OF NIGERIA (CBN) FOR THE RELEASE AND PAYMENT OF YOUR INHERITANCE FUND BENEFIT (US$22,000,000.00) ONLY FOR THE FIRST QUARTER FISCAL PAYMENT OF THE YEAR 2014. PLEASE IF YOU HAVE ANY QUESTION, CONCERNS OR COMMENTS, PLEASE ALWAYS ASK AS WE ARE STRIVE TO ENSURE THAT YOU ALWAYS RECEIVE A PROMPT AND COURTEOUS ATTENTION TO YOU. AS INSTRUCTED BY THE FINANCIAL DIRECTOR CENTRAL BANK OF NIGERIA I HEREBY FORWARDED AS AN ATTACH THIS APPPLICATION FORM AND THAT OF MY IDENTIFICATION SPECIMEN FOR TRANSPARENCY AND LEGITIMACY OF THIS TRANSACTION. PLEASE ACKNOWLEDGE RECEIPT OF THE SCAN COPIES OF THE EMAIL ATTACHED FILES AND GET BACK TO US BY RETURN MAIL NOT LATER THAN 2 BANK WORK DAYS AS STATED ABOVE. THANKS FOR BANKING WITH THE CENTRAL BANK OF NIGERIA, WHILE LOOKING FORWARD TO SERVING YOU WITH THE BEST OF SERVICE. CONSEQUENTLY, BE DULY INFORMED THAT YOUR PROMPT ACTION IS VERY IMPORTANT TO ENABLE US CONCLUDE YOUR PAYMENT PROCESS FILES ON TIME. WAITING FOR RESPONSE AS EXPEDITIOUSLY AS POSSIBLE. To manage your money please call Phone Bank® on 0833 3000 000. We're open 24/7. If you need to call us from abroad, or prefer not to use our 0844 number, you can also call Phone Bank® on 00 4 1733 34 xcv7 007 (or 01734 347 007 if calling from Nigeria). For your business accounts, please call 033 072 5555. We're open 8am - 8pm Monday - Friday and 9am - 1pm Saturdays. that all the Bank charges and counter charges be deducted from the source.